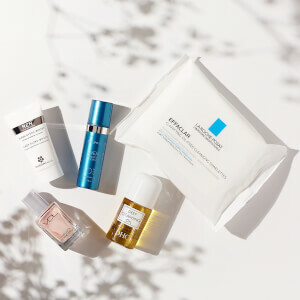 The Preventative Kit from PCA Skin combines five skincare treatments that work in tandem to fight premature signs of ageing and shield skin from free radical damage. Achieve a revitalised, nourished and refined complexion with a youthful looking glow. Strengthen skin with this gentle yet highly concentrated serum, containing 20% Vitamin C and 5% Vitamin E to infuse skin with antioxidants and nutrients. The pair work in synergy to promote an even and clear skin tone, with the appearance of fine lines, discolouration and wrinkles visibly reduced. Achieve a radiant glow with the Rejuvenating Serum. Brimming with antioxidants and nutrients, the lightweight serum seeks to combat signs of premature ageing and protect skin with Grapefruit stem cell extracts and epidermal growth factors. Skin appears refreshed and healthy-looking, with the look of fine lines and wrinkles effectively reduced. Combat signs of ageing with the Retinol Renewal treatment. Gentle yet effective, the nourishing serum infuses skin with a balance of potent Retinol and age-defying botanicals to minimise the look of fine lines and wrinkles. Vitamin A and Grape Seed extract seek to promote a more even and clear skin tone, while Sodium Hyaluronate infuses skin with moisture. Rich in vitamins and antioxidants, the lightweight moisturiser is rapidly absorbed to deliver essential hydration and nutrients. Fortified with Evening Primrose and Borage Seed Oil, it calms the look of skin irritations and protects skin from harmful free radical damage. Skin feels softened and replenished. Combat sun damage with the broad spectrum SPF 30 sunscreen. Powered by Octinoxate, Octisalate and Zinc Oxide, the non-greasy formula absorbs, deflects and filters harmful UV rays. Enriched with Panthenol, Silybin and Caffeine, it effectively hydrates and nourishes skin with essential antioxidants and vitamins while actively fighting discolouration. C&E Strength Max: Apply a pea-sized amount to the face and neck in the morning after cleansing, toning and applying any PCA SKIN®treatment serums. You might experience a slight tingling sensation upon application. Follow with the appropriate PCA SKIN broad spectrum SPF product in the daytime and moisturizer in the evening. Serums: After cleansing, apply one to two pumps over entire face, focusing on areas of persistent redness. Follow with the appropriate PCA SKIN® broad spectrum SPF product in the daytime and moisturizer in the evening. Rebalance Moisturiser: Smooth onto skin after cleansing and applying any PCA SKIN® corrective products. Allow to penetrate. If used in the morning, follow with the appropriate PCA SKIN® broad spectrum SPF product. Sunscreen: For the best protection, apply every day, year-round, in every type of weather. Apply sunscreen 15 minutes prior to exposure to allow the active ingredients to penetrate the skin.